Swaziland was granted a good deal of autonomy in the 1800's, as the tribes already had a well-functioning government, so was not seen as needing control. Indeed, in 1881, the British signed a deal guaranteeing the Swazi peoples independence. 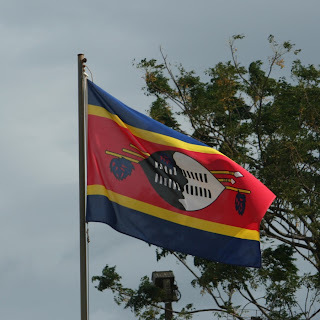 The flag in use was made up of alternating light and dark blue stripes, with a Swazi shield placed in the centre. However, with the advent of the Boer wars, the British took over the territory, and controlled it as a protectorate, attached to the Transvaal. This led to the Transvaal Vierkleur being flown over Swaziland. In 1968, Swaziland finally gained its independence, and set up a constitutional monarchy system of government. However, in 1973, the king suspended the constitution, and ruled by decree. Whilst political activity has been on the increase in recent years, power is still in the hands of the king. The flag adopted in 1968 consists of 5 horizontal stripes. A central red stripe bound by 2 blue stripes. With 2 thin yellow stripes dividing them. The red represents past battles, the blue represents peace and stability, and the yellow represents the natural resources of the nation. In the centre of the flag is a Swazi shield, coloured black and white. This is to show harmony between the black and white peoples that live in Swaziland. The shield is reinforced with a staff, and above the staff are 2 Assegai style spears.